Cedar City Children’s Musical Theatre is a nonprofit performing theater with humble roots. Founder and board member Denise DeMille started the group in her garage doing little family productions, Karpel said. The first performance was “Peter Pan” in 2009. DeMille wanted every child to be able to experience the performing arts, Karpel said, so she expanded the performances and the Cedar City Children’s Musical Theatre was born. The nonprofit, all volunteer group provides a fabulous teaching and learning experience for the kids, Karpel said. Almost all of the productions — from the actors to the bulk of the stage crew — are run by children, many of whom have been with the theater for years. The theater’s production of “Joseph and the Amazing Technicolor Dreamcoat” will offer a unique take on the famous Broadway musical; one that gives each child a chance to really shine, Karpel said. The show’s director, Jewly Krause, has created several mini characters as well as parts for specialty dancers that give more children the opportunity to perform, Karpel said. 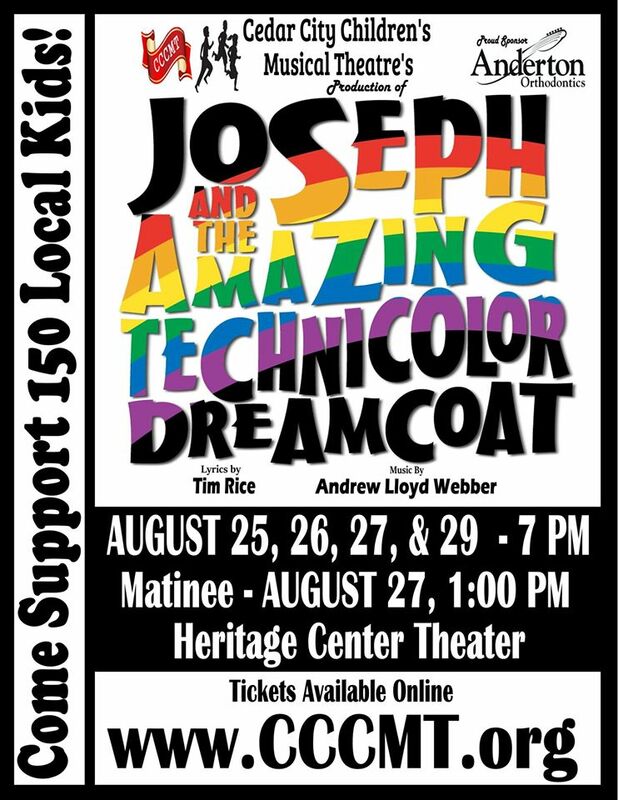 Cedar City Children’s Musical Theatre’s production of “Joseph and the Amazing Technicolor Dreamcoat” will run Thursday-Saturday and Monday at 7 p.m. at the Heritage Center Theater, 105 N. 100 East in Cedar City. There will also be a Saturday matinee performance at 1 p.m.
An American Sign Language interpreter will be available for the hearing impaired during the Saturday matinee performance. Tickets are $10 for reserved seating and $7 for general seating. Guests can purchase reserved or general seating online. General seating will be available at the door with the possibility of reserved seating on a first come, first serve basis, Karpel said. When: Aug. 25-27 and 29, 7 p.m. | Aug. 27, 1 p.m. matinee. Cost: General seating, $7 | Reserved seating, $10. Purchase tickets: Online (reserved and general seating) | At the door (general seating). Additional information: An American Sign Language interpreter will be available for the hearing impaired during the Saturday matinee performance.